This post was written for Imaging and Microscopy. Raman spectroscopy can be used to detect changes in tissue biochemistry following traumatic brain injury (TBI). Researchers at the University of Cambridge (UK) and Istituto di Ricerche Farmacologiche Mario Negri (Milan, Italy) examined the evolution of brain tissue composition at 2 and 7 days after traumatic brain injury. ‘Raman spectroscopy enables us to study changes in protein concentration and lipid composition, which are of particular interest in brain repair’, says Sarah Bohndiek, the physical sciences lead from Cambridge. TBI is a leading cause of death and disability. The ultimate tissue fate is determined not only by the initial disruptive force but also by a cascade of complex inflammatory processes that may be long-lived and widespread. It should be possible to individualise and develop new targeted therapies but these processes are poorly characterised, making progress challenging. ‘Label-free methods for probing the biochemical signatures of injury processes that are also sensitive to structure may offer insights into TBI pathophysiology beyond the current standards of in vivo cerebral microdialysis or post-mortem histopathology’, says Ari Ercole, the clinical lead from Cambridge. 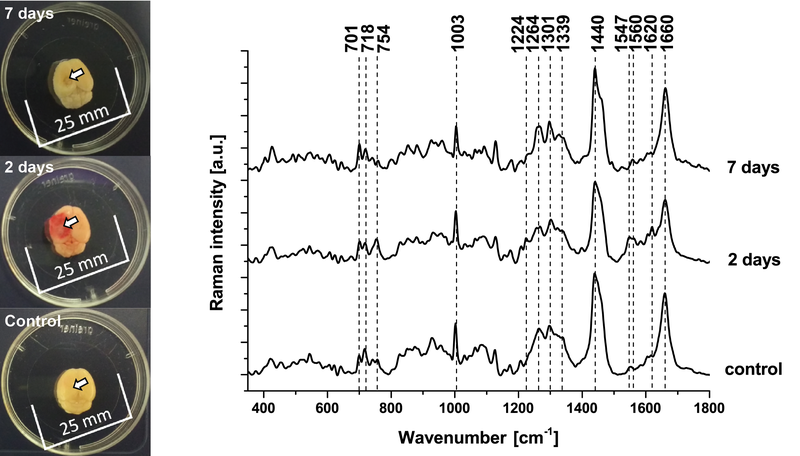 Raman spectroscopy is a powerful bioanalytical tool based on the inelastic scattering of photons by molecular bonds; as each bond has a characteristic vibrational energy, the spectrum of Raman scatter peaks provides a unique fingerprint for a given sample. Unfortunately, the Raman effect is relatively weak (fewer than one event per 107 elastic scattering events) and is often obscured by strong tissue autofluorescence in the visible region of the spectrum. To overcome the challenge of tissue autofluorescence, we chose to excite the brain tissue using the near-infrared wavelength of 785 nm. However, Raman scattering probability falls dramatically with increasing wavelength. Therefore, despite using a commercial confocal Raman microscope (Witec), to acquire reliable spectroscopic data with spatial and temporal resolution we had to establish a standardized protocol. To study the early phases of repair after TBI, the Cambridge researchers teamed up with Elisa Zanier and her team at Mario Negri Institute, who are specialists in refining experimental models of TBI and developing neurorestorative treatments. In their experimental mouse model, they apply a mechanical injury to the left parietotemporal cortex. The team measured Raman spectroscopy data from the site of the injury (contusion core), locally around the injury (pericontusional), from the hemisphere contralateral to the injury site and also from ‘sham’ mice that did not experience TBI. The spatial and temporal distribution of the Raman spectroscopy data shows dominant spectral contributions from lipids and proteins. Excitingly, the team observed statistically significant spectral changes comparing different spatial locations in the brain and different time points after injury (dotted lines, Figure 1). The temporal changes were consistent with two key features of TBI: firstly, increased signals from haemoglobin, associated with acute haemorrhage at 2 days after injury (e.g. 754, 1224, 1547, 1560, 1620 cm-1); and secondly, changing lipid composition from phospholipid (e.g. 718, 1301 cm-1) to cholesterol (e.g. 701, 1670cm-1), associated with cellular repair. Figure 1. Raman spectroscopy reveals changes in tissue biochemistry following traumatic brain injury (TBI). Average Raman spectra from the core of the contusion after 2 and 7 days after TBI indicated by arrow in the insert photos. Control spectrum is taken from a sham experiment. Spectra were acquired at 785nm, with 1 s exposure and 10 accumulations using a 300 mm triple grating imaging spectrometer with 600 g mm-1 grating; the average is performed over 30 separate spatial points. Our first Raman spectroscopy studies in TBI have demonstrated not only that Raman spectroscopy is sensitive to temporal biochemical changes, but also that signal changes have an anatomically sensitive long-range spatial distribution. Changes in cholesterol, phospholipid and protein are implicated in key pathological processes and are therefore potentially biologically important markers of TBI biology. Raman spectroscopy therefore shows promise as an experimental tool for the study of TBI but could also be used in the future as a clinical monitor; future work is needed to establish the potential sensitivity and specificity of the technique. Surmacki J.M., Ansel-Bollepalli L., Pischiutta F., Zanier E.R., Ercole A., Bohndiek S.E. Label-free monitoring of tissue biochemistry following traumatic brain injury using Raman spectroscopy. Analyst. 2017; 142:132-139.